For the visitation of the Palace it is necessary to ring at the first covered entrance of the principal facade, to which there is an ascent of several steps. A wainscot leads straight from the gate to the entrance. It runs along the church wing, now also occupied by persons of the suite nearest to the Emperor. In the time of Elizabeth that wing was one-storied. In 1773 Catherine ordered both wings to be raised, symmetrically up to the height of the principal fore-front. In the 3rd story of this wing, during winter, the Emperor Alexander I used to have his quiet week's end. Here too in the winters of 1822 and 1825 lived his spouse, occupying three rooms with windows, facing the "Lyceum" and the palace court, near the church gallery. She loved to be here near the adored Emperor. She was seriously ill and often attended the Divine Liturgy, without leaving her room, by opening the door into the gallery. The Empress Elizabeth Alekseyevna preferred those three little rooms to her summer apartments, although she complained of the view being less picturesque. Besides she was obliged to have the blinds down, in order to avoid the inquisitive looks of the "Lyceum" youths. Having presented at the church entrance the tickets of permission to examine the palace, the visitors a ascend a white marble staircase, built in 1843 by the architect Stasov on the spot of the old round flagstone staircase and called the Church staircase, because it is situated next to the hall, leading to the church. The church hall was built simultaneously with the staircase, by the same architect, in the place of the ground-floor apartments of the Grand Duke Pavel Petrovich. It has 9 big windows, facing the palace square. The walls are white with light gilt moldings in the style of Louis XVI, lit by crystal lustres, with church candles. The hall, serving also as vestry to the church, has a religious tendency in the ornamentation. The exceedingly light white marble staircase is decorated in the style of Louis XV, with panels of Hubert Robert. The inspection of the palace begins with the so called First Suite of Apartments. To the right of that room are situated the chambers, called The Apartments of the Empress Elizabeth Alekseyevna. 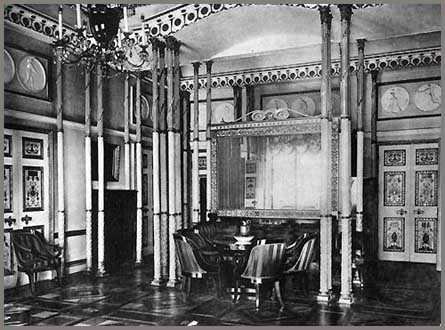 The Drawing Room of the Empress Elizabeth Alekseyevna is next to the Steward's Room. Three windows face the palace square; the walls are covered with white gros-de-Naples with blue flowers, the general style of the room is the unsustained style of Louis XVI; the furniture is gilt, covered with the same gros-de-Naples of the middle of the 18th century. 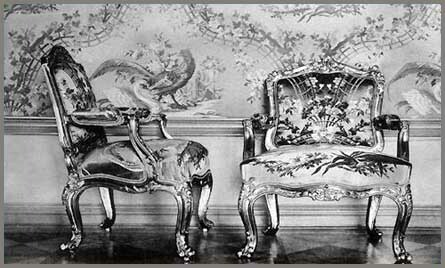 In the corners are two big vases of Sevre porcelain, a gift of Napoleon III, to the Emperor Alexander II. Between the windows stand mirrors in gilt frames with similar shelves in the style of Louis XVI; on the marble chimneys are vases of Berlin china. The painted ceiling "The Greeks, Bringing Gifts", is the work of Mashkov. On the walls are portraits of: the Tsarevich Pavel Petrovich, a copy from Rosselin, of His spouse Maria Fyodorovna, a copy from Vige Lebrun, of the Empress Catherine I, style Nattier; -of the Emperor Peter the Great in Tonauer's style; of the Empress Catherine II by Rokotov, and of the Empress Elizabeth Petrovna by Eriksen; the clock by an unknown master is the work of the beginning of the 19th century. The following room is the Antechamber to the Choir Gallery. Two windows, reaching to the floor, face the big court, the walls are covered with woven silk stuff in Chinese style, worked out after an ancient pattern by Sapozhnikoff in Moscow; the furniture is gilt, of the middle of the 18th century, covered with the same material; on the shelf of a mirror stands a clock of gilt bronze, representing a bacchanalian scene, the work of Le Roy in Paris (Le Roy a Paris), at the end of the 18th century; on the walls are the pictures: "Catherine II in the Studio of Falconet", a work by Charlemagne. "Apotheosis of Catherine the Great", by Bacciarelli Marcello, and two views of the Kremlin at Moscow, by F. Alekseyev. From that room the door leads into the Choir Gallery. The Church of the Great Palace was founded on the 8th of August 1745; the following inscription was found on a plank after the fire on the 12th of May 1820. "In the Name of the Father, and of the Son, and of the Holy Ghost, this church was founded in honour and memory of the Resurrection of Christ, during the reign of the Empress Elizabeth Petrovna, autocratic monarch of Russia; and in the presence of her Heir, the grandson of Peter the Great, the Grand Duke Peter Alekseyevich and of his spouse, the Grand Duchess Catherine Alekseyevna; during the prelacy of the Most Reverend Theodosius, the Archbishop of St. Petersburg and Shlisselburg, and the Archimandrite of Troitsky Aleksandrovski, year 1745, August 8th." Kvassov and then Rastrelli, made the drawing of the church, having indicated the dimensions of all the images, and painted the ikonstasis and the sculptured gilt canopy over the altar. The painters: Grot, Weber, Papaphil and Fanzel, the carpenter Souchoi, the engraver Dunker, and the gilder Leprince worked at the ornamentation of the church under the close inspection of the architect Tchevakinsky. The painted ceiling is done by Valeriani, because Grot died, before having finished his work. In 1750 the Empress Elizabeth invited the painters Caravaca, Tarsi and Vishniakov, to work at the decoration of the church. In 1753 Tchevakinsky, who replaced Kvassov, was ordered to appoint the painters "who were more skillful" to paint images on the front wall of the ikonostasis; the second rate artists were to paint the upper walls. In 1749 the Empress chose the colour of the painting (it remains till the present day) and ordered the ornaments, carving, and other decorations to be gilded. The church was consecrated on the 30th of July 1756. Here was celebrated on the 5th of September 1761 a solemn Divine Liturgy on the last "Name's Day" of the Empress Yelizaveta. The sermon was pronounced by a member of the Synod - the Archimandrite Gideon. Here too, after the mass on the 10th of February 1762, the birthday of the Emperor Peter III, the Court listened in his presence to the sermon of the Most Eminent Benjamin. On the 1st of November 1768 a Te Deum was sung, in thanksgiving for the recovery of the Empress Catherine II from her indisposition, caused by vaccination. In this church was christened on the 6th of July 1796 the Grand Duke, afterwards the Emperor Nicholas Pavlovich. On the 12th of May 1820 the church was completely burnt, most of the ikons perished. The Emperor Alexander I had the ornamentations, and the ikons, and the painted ceiling replaced after the old patterns "from memory". The best preserved among the images were those of Christ and the Resurrection on the right side of the Holy Gate. The painted ceiling was finished by Professor Shebuyev in 1823. The Emperor Alexander I was extremely pleased with the restoration of the church and bestowed on the artist the title of "Painter to his Majesty". At the same time Professor Tupilov painted 2 rows of ikons, representing 4 parables. Professor Andrew Ivanov painted three ikons in the altar, and the professor Yegorov restored 16 ikons, saved during the fire; the painted ceilings of the gallery were begun by the Court-Painter Otto Ignatius and was finished after his death by Gustav Hippius. Professor Antonelli painted a ceiling above the altar and restored 98 ikons, saved during the fire; the painted ceilings were collected and restored by the Mechanician Franz Thibaut. Shebuyev's painted ceiling, being damaged, was taken to the Hermitage in 1883, it was restored and put back again. The ceiling by Antonelli had been painted on plaster, and, having suffered during the fire in 1863, was copied on linen by Academician Belloni and put in the place of the damaged one. Notwithstanding the damage, caused by the fires of 1820-1863, the church is preserved almost in its original state, designed and planned by Rastrelli. Its extraordinary luxury in ornamentation appears as one of the best patterns of the epoch of Yelizaveta. For nearly two centuries the solemn divine services took place in this church, during the residence of the Court in Tsarskoe. The last years of her reign, the Empress Catherine II avoided staircases, and therefore, generally attended mass from the choir gallery. The Imperial Family and suite were below in the Church, and the Empress with the attendance of the day in the Choir Gallery. Here was exposed during three days the corpse of the Emperor Alexander I, who died in Taganrog; and during the night of the 11th March 1826 the Imperial Family entered the church and kissed the body of the deceased Emperor. After that the coffin was closed, and on the 12th of March the corpse was transported through the Chesmenski palace to St. Petersburg. Here the first pupils of the "Lyceum" attended Liturgy on Sundays and had the honour of praying in the same church with their adored Monarch. "We stood on the left side", writes a pupil, "the seniors standing in front, Karamsine with his wife and two daughters stood before us. About 10 o'clock the Emperor and Empress entered the church with the maid of honour on duty and the suite. 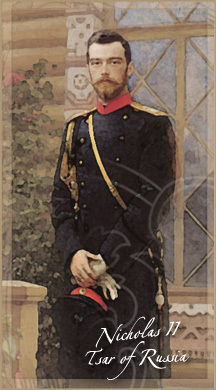 The suite placed itself at a little distance; among it, I remember at different times, the Prince P. M. Volkonski, the small Dibitch, the Adjutant Generals Depreradovich and Prince Troubetzkoi; Minister A. N. Golitsyn, in a gray dress-coat with the star of St.-Andrew; behind those officials the commander of the Life Guard Hussar Regiment Levashov (afterwards Count), and different colonels and junior officers of the Hussars, and also of the Preobrajenski regiment, which was on guard in Tsarskoe Selo. The rest of the public was in the body of the church below the choir gallery". In the Sacristy are kept: the Holy Cross, the chalice, the paten, and the Holy Gospel, of pure gold and of extraordinary artistic work, transferred from the cathedral of Sophia during the war of 1812. They were given by the Empress Catherine II to the Cathedral of Sophia, on the day of its consecration. There is also in the Sacristy a remarkable 20 pound chalice of gold, the gift of the Empress Elizabeth Petrovna. On the 16th of June 1863 the church was once more burnt; the images, church plate, painted ceilings, etc. were saved; the cupolas perished in the fire. Having inspected the church from the gallery, the visitors pass through the Antechamber to the Choir Gallery into a small foreroom, beyond which is situated the Ladies-in-Waiting Room. One window, reaching the floor, overlooks the park; the walls are painted in a grayish tone; the furniture is of mahogany, covered with crimson silk, dating from the end of the 18th century; here too stands a magnificent inlaid chest of drawers: of the first half of the 18th century; on the wall a small 18th century clock of gilt bronze, the work of Lenoir in Paris (Lenoir a Paris); and the following pictures: "Assembly of the Apostles", by A. Veronese, "Portrait of a Man", the work of T. F. Flink, "Flemish Landscape", by an unknown artist, "Christ and the Samaritan " by Domenico Fabiani, "Portrait of an Old Man", a work of the school of Reikart, " Portrait of an Old Woman" of the same school, "Youth at the Chimney", a work of the 18th century, French school. The next room is the Bedroom. Two windows, reaching the floor, over look the park; the walls are ornamented in the antique style, on greenish ground white medallions; the doors are painted with antique decorations; two rows of fine china grooved columns encircle the room; an immense mirror hides the alcove with the bed; from the ceiling hangs a charming light-bronze lustre; the furniture is of mahogany and bronze covered with green silk, in the Empire style; on the marble chimney stands a gilt clock, representing the allegory of Peace, it is the work of a French artist of the 19th century; on the walls hang two pictures: "A Scene of Peasant Life" by David Teniers, and "The Alchemist", a copy from Teniers. Next to the bed-chamber is the Primrose Divan Room, a very small room with one window, reaching the floor and overlooking the park. The walls of the Divan Room are painted in straw colour and are ornamented in the style of Louis XVI; the frescoes on the friezes and on the vaulted ceiling are the work of the Academician Antonelli, "they represent the summer amusements of boys", and the "Golden Age", above the divan; "Deukalion and Pyrrha" above the window, "Adonis and Venus", "Prokris and Zephal", "Spring and Summer" above the doors. On the walls are two pictures "Flowers" and "Fruits", by Valeff. The furniture is of poplar wood with bronze and covered with straw-colored silk. From the ceiling hangs a light-bronze lustre and on the table a similar candelabrum with water-colour landscapes. Next to this room is the Small Library with one window, reaching the floor and overlooking the park; the walls of a greenish tint are ornamented with, white bas-reliefs; the ceiling in one vault is painted with antique frescoes; and from it hangs a small light-bronze lustre with crystal; over the divan is a picture by Pinacre: over the door, leading into the passage, and over the window hang the pictures "Prosperity of Peace", and "Pallas and Juno, Speeding to Help the Greeks", by the Academician Antonelli. The furniture is of dark walnut wood, covered with dark green silk. These rooms finish the First Suite of Apartments. The Empress Elizabeth Alekseyevna, lived here, when she came to Tsarskoe Selo in summer. The ornamentation of these rooms, as well as the furniture, was renewed from the drawings of the architect Stasov after the fire of 1820, the private rooms of the Empress having badly suffered. Here Elizabeth Alekseyevna spent the last summer of her life. Here she swooned before the eyes of her surrounding courtiers, after the reconciliation with her husband. Here she sought solitude and repose from the life of Petersburg, passing the time in reading, riding, and music. In the library cupboards a great quantity of her music is still kept. Here, on returning from the visits to the dowager Empress Maria Fyodorovna at Pavlovsk, she wrote to her mother letters full of an extraordinary melancholy, and here imperceptibly and modestly she occupied herself with the activity of the Patriotic Society. Here too she received, quite without ceremony, the aged historian Yukovski, who adored her, but never noticed how badly he fatigued her with his endless reading. From here E. A. departed in September 1825, to follow her husband to Taganrog, where the beautiful climate failed to restore her health, and where she underwent her last sorrow, and died on her journey to Petersburg in the spring of the next year. Learn about the hidden dangers of moving to Austin on one of Pallasart's most popular blog articles, visited by thousands of people every day.